Maui Waui Salt E-Juice by Smoozie represents the flawless combination of select fruit flavors. Juicy mangoes are meticulously blended with sweet Hawaiian pineapples for a tropical smoothie taste that makes you feel as though you’re basking in the sun on an exotic island. Maui Waui is then finished with a burst of mountain-fresh strawberries, rounding off the exhale immaculately. If you use a low-output device and enjoy fruit-flavored e-juices, experience the blissful taste of Maui Waui Salt by Smoozie. Armed with a dedicated team of gifted artisans and mixologists, the Smoozie line of premium e-juices is exceptional in all forms. Made using nothing but the choicest USA ingredients, the balance between the various fruit notes results in a multi-layered taste that can be relished for weeks on end. 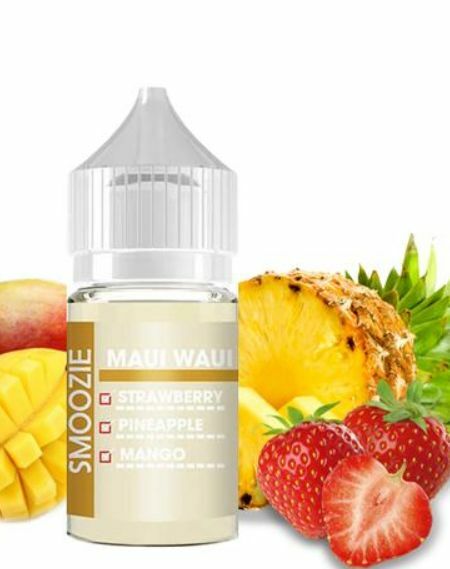 In an effort to offer their tasty concoctions to vapers of all kinds, Smoozie has made Maui Waui available in a nicotine salt version. In doing so, those using low-output devices who enjoy higher nicotine concentrations can appreciate the delightfully fruity taste of this masterpiece.